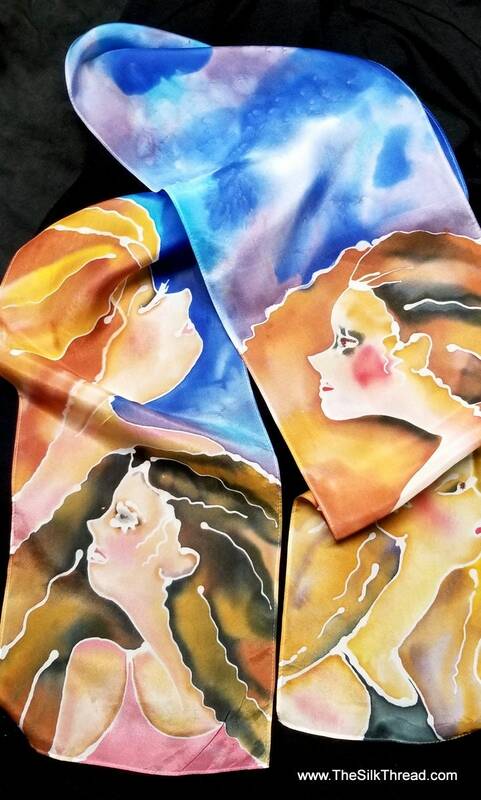 This is a one of a kind, hand painted Silk scarf. It has my exclusive hand drawn Whimsical Ladies across the surface at both ends. The design has rich blues and purples in the background. Make a bold statement with your girlfriends! This 8" x 72" scarf is 100% silk. In many of my scarves I either hand draw and dye the designs or I design and carve my own reliefs, build the blocks and print my designs with textile inks to imprint the design onto the silk. The results are classic designs, beautiful colors and a one of a kind silk scarf. This is pure silk fabric which gives the lovely "shine" that is so desirable in silk clothing and accessories. Everything hand done on my farm in my North Carolina studio. Other dog breeds available per request! Remember, your finished scarf is the only one like it! Hand wash in cool water drip dry. Iron if needed with pressing cloth.